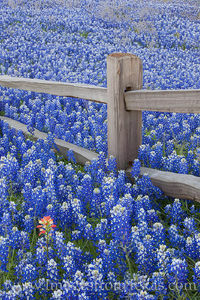 "Bluebonnets along a Wooden Fence 4"
Fine Art Satin Photographic Papers print bright colors and ultra sharp details. This gallery quality paper is a top choice for printing landscapes and nature images where you want capture the vibrant colors combined with low reflections from the paper. Gallery wraps are printed on white archival poly-cotton blend matte canvas. The canvas is wrapped on a 1.5" stretcher framed and finished with a durable black backing. The gallery wrap arrives at your doorstep ready to hang. After an order is submitted, the canvas usually arrives within 5-6 business days. While gallery wraps are more expensive, there is no need for matting and framing. After a fine art print is matted and framed, the cost is often equivalent or even slightly more than a gallery wrap. Gallery wraps are available in both classic canvas and pearl canvas. Orders will be printed using the classic canvas unless requested. Vivid metal prints are a unique way to display your favorite images. This product adds an artistic edge and contemporary elegance to the final print and offers a unique high gloss fine art option. These rich and colorful prints on metal come with a float mount on the back and ready to hang. Prints on matte, satin, or metal paper usually arrive within 5 business days of the order being placed. Prints on canvas or metal usually take around 7 days to arrive.